I looooooooove mangoes… Sweet, sour, mild, pickled, raw, ripe, salted, juicy, aromatic, succulent, heavenly perfumed… I can safely call it my first love, because my love affair with them started even before I knew what actually love is all about. Even decades later, the these heavenly mangoes still has their magnetic hold on me. It is more than a mere fruit to me. It represents my blissful childhood days of endless summer days. The memories of those sunny, glorious summer vacations are still fresh in my mind. Fond memories of eating sour raw mangoes with salt and chilli powder and of biting into a lush, golden mango and get that sweet, sticky juice squirting all over my chin and cloths without worrying about anything. Ah!!! It feels like just yesterday, climbing mango trees with my sister and cousins and aiming a slingshot at our neighbour’s tree. I still can’t understand how this tantalising, magical fruit turned me from Miss Goody Girl into mischievous brat. These are some moments of my life which will always remain fresh and will always bring smile. Add salt to boiled water and keep it aside to cool completely. 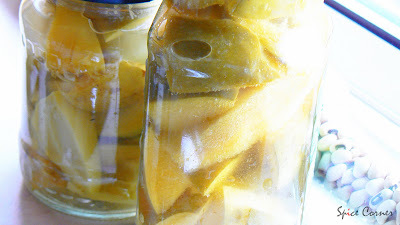 Cut mangoes into little big pieces and place them in an air tight glass bottle. It is recommended to use glass bottles instead of plastic container as it has high salt content. Now pour the salted water into the jar till all mango pieces are covered and close the lid tightly. Keep this jar in cool, dark place for at least 1 week before using them. This way you can store them for at least 6 months. Remove excess water and chop mangoes into small pieces. Mix them well with curds, jaggery, chopped red onion and green chillies. You can add more jaggery if you like it sweet. Season it with mustard, red chilli and curry leaves. Chill them before serving with rice and chapatti. 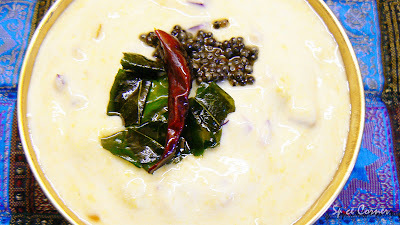 Take oil in a pan and add urad dal, mustard and red chillies. Sauté them till urad dal turns golden yellow and mustard starts spluttering. To this add chopped green chillies, turmeric powder and curry leaves and sauté them for few seconds. At this point you can also add a tbsp of chopped onions if desired. Now add mangoes in brine and mix well. Cook this in medium flame fro 2 minutes. Add jaggery powder and cook in medium flame for another 2 minutes till a syrupy base is formed. Remove from fire and serve hot as a side dish with rice or dosas. Gojju and palya are sweet side dishes. Add red chilli powder if you like them hot and spicy. But it tastes best sweet and sour. Note that you don’t need to add any salt to these dishes as they usually have high salt content. So it is better to check them for the saltiness before cooking. If they are very salty then immerse them in big pot of water before cooking for few minutes to remove excess saltiness. 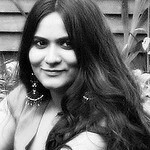 Also take a look at lovely Linda's Mangoes in Brine Dal Recipe. Mango is known as aam in Hindi and amra in Sanskrit. Amra is first mentioned in the Shatapatha Brahmana, which dates back to 1000 BC. According to Varadrajan, author of The History of Tamil Literature, the eye of a woman is compared to a tender mango cut in half, with the stone being the pupil of the eye. Alexander the Great was a big fan of Indian mangoes and The Mughal Emperor Babur called it "O Fairest Fruit of Hindustan." His grandson Akbar planted 100,000 mango trees in Dharbanga. The British, too, were enamored with the mango and created special cutlery to eat it in a "civil manner." Mangoes are effective against sunstroke and are used in a variety of drinks to lower body temperatures and quench thirst in the hot summer months. Rich in Vitamin C, mangoes are used throughout the year in the Indian diet, with the pickled green mangoes helping to ward off colds. Even the powdered seed is used as a cure for dysentery and the twigs of the mango tree are handy as toothbrushes. Awww...why do you have to do this? :) See I am drooling. I am in love with mangoes too, in any form, sweet, sour, salted or whatever. Back home, grandma preserves small type of whole mangoes in brine. I couldn't find that type of mangoes where I live now. So I thought it was impossible to make it. I will try with the big green mangoes like you did... only if I am lucky enough to get good ones. Oh very nice post on mango.Enjoyed reading the post. Woow,20 varieties of pickles!! !We used to do chammanthi with uppu manga,In our place we will put the whole mango in that brine.So U and Ur sister were very naughty,I got a picture of u and ur sis,hahaha...Still u have that courage to climb all the trees! I LOOOOOOOVE mangoes too! oh my gawd, I could eat them till the cows come home...heheheh...mangoes in brine eh? I think I might have had this, sounds very familiar. I had this South Indian Nurse Sheela who worked with me, and she used to bring me treats all the time in exchange for Handvoh! you have OVER 20 pickles in your pantry, whaddaya do, eat them like a sabzi or what? and Mataji, thanks to your idea, I changed the name of Winter food swing to "Spring Fling 2007"...come and check out the *new* cool button. Sia ..this is too much..i am drooling over here..I love mango with salt and chilli powder.....i like the way i wink my eye while having a sour bite.....Thanks for this wondeful recipes..I liked both the recipes. I like the slide too, it's a new addition i guess? Lucky Girl..you have 20 pickle varieties in your pantry...Lord please move me to UK !!! Boy!!!! I had to click on the comment about 10 times before I got in!!!! WOOOWW!!! 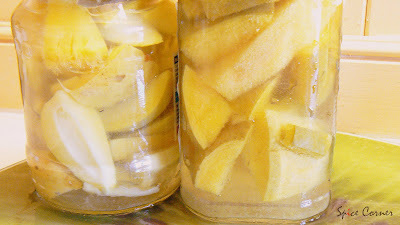 !I saw this mangoes in brine at Linda and now you are on to it! !So many dishes in one post! !Wait a minute! !Look who's is talking?!HeHe!! They all look mouthwatering!! !There is one typo "Gujju for Gojju". I made a Gojju too for Nupur today. Great recipes Sia,thanks.I will try and see if I can find bottled Mango. Its been a few years now since I had mango in brine. I knew only a chutney with coconut and a saaru with this. Mosaru Gojju sounds tangy, a whole new level of taste. As usual Nice pictures there..
the mango dishes are looking tasty!!! yes shn, it is uppu manga. 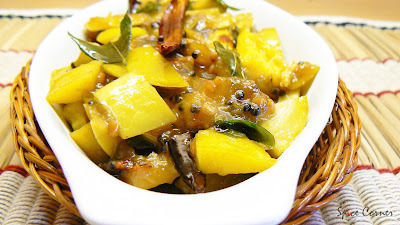 mom makes this with very sour mangoes which is best for these two dishes. u need large mangoes for this recipe. 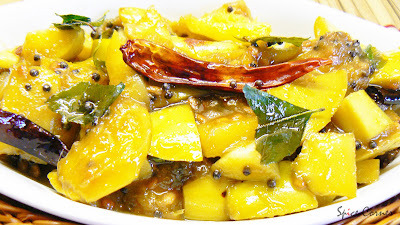 use very sour mangoes for this dish which is tangy and sweet. now what are we waiting for girl? where r ur MIL's recipe? do post them. thank you dear:) glad u liked it. try making them at home manju. 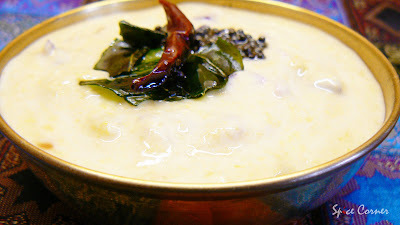 i made this uppu mavinakai some 3-4 months back and it was really good to have it. Reading about salted mangoes brought water in my mouth. I simply love them. Never made palya with them though. We get very good raw mangoes here, will try this sometime. Hmm, the same "aam" in Hindi also means "ordinary", right? Like "aam janata".. wonder if there's any connection in the etymology. Beautiful post, anyway! Keep it up! Sia do I have to tell you that my mouth is watering even as I read your post. Mango with salt and chilli powder oh my, summer was mostly about mangoes when we were kids. The raw mangoes we get here are sweet so it is really hard to get a kick out of eating with chilli powder and salt or making any dishes but I am going to try your second and third recipe anyway. Hey Sia, I am so fond of Mangoes...and all your recipes looks wonderful... I am amazed to know you have 20 varities of Mango pickle...Phew !!! 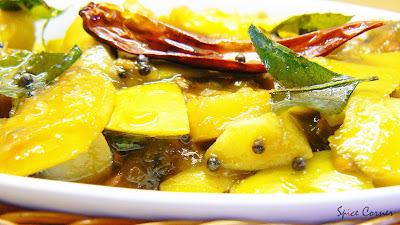 loved reading your childhood memories..
We do instant pickle too like just chopping into small piece..mix chilli powder and salt,then season it with mustard,broken urad dhal,which goes well with curd rice..
hmm well here we don't get those big mangoes i just miss those kuchkai mavinkai, i manage to prepare with the smaller variety.i haven't tried preserving it must give a try. My previous comment didnt seem to be saved. u need raw green mangoes for this. sour mangoes are the best for both recipes. yes... summer has started in india, not here:( wish i was there. my sis is busy making me go crazy with mango treats. what is kuchkai mavinkai? is it a mango dish or mango itself? do let me know. woh!!!! sia!! thank u for visiting my blog!! just now noticed that u'r side bar has moved down on the template? is it me or can u see that as well? never seen amazing snaps like this!!! Oh my!! Nange ee laptop kithukondu thin beku anistha ide :) Looks so inviting and delicious. Great job Sups! 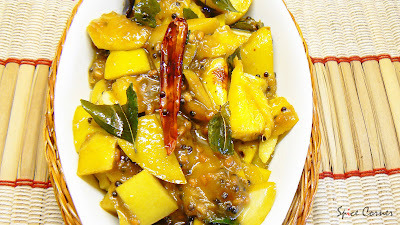 Heyyy..Your pickle takes me to my grandma's kitchen and the big pot ( bharani) in which she preserves the tangy, salted mangos in brain...ohhhhhhooo..i am drooling.enjoy.! Henegya ninage 20 varities sikidu? indianda bapaga ella hothukondu bandeya? hmm enna baili neeru batha iddu anu yavaga hopada eno? 20 varieties? 20!!! 20!! !Lemme in!! !